Project details:We offer a leadership programme which will enable participants to gain an insight into the quality of education, and an awareness of the problems associated with public health and livelihood generation in rural areas,as well as environmental educational programs.Theseinclude games and workshops through direct engagement and involvement of local and outside volunteers. *NOTE: This report is intended for the sharing of experiences and to promotenatural and environmental conservation, and to encourage other visitors to participate. It is NOT for commercial purposes. 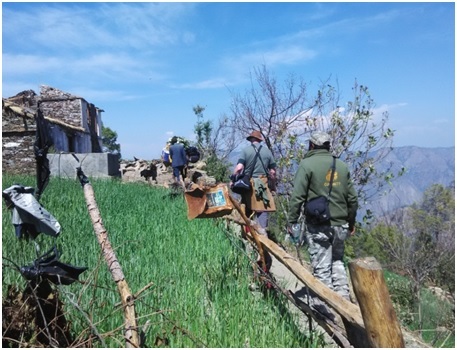 We organize activities and trekking on request for your support towards social as well as Nature and Wildlife conservation. For each activity, we invite volunteers based on their skills and availability. Volunteers will work with two semi-permanent members of the team who are themselves volunteers, and are in regular contact with the project and who plan and cost out all activities. 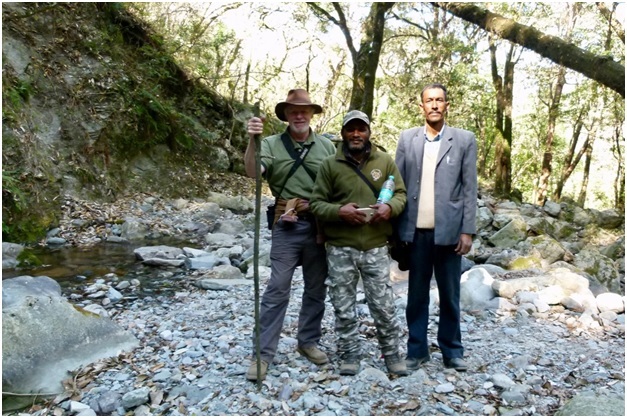 Ramesh Suyal: A well-known nature guide in the Jim Corbett National Park, a social worker, wildlife conservationist and trekker,amongst many other activities. He is the owner/managerof an organisation in the Corbett area called “Tigers In Corbett”, a reputed tour and travel company that organises a variety of types of jungle safari, trekking and other eco-tourism related activities and experiences. He is a well-known and committed Nature guide and The Billy Arjan Singh Memorial Awardee for Wildlife Guide of the Year 2014. 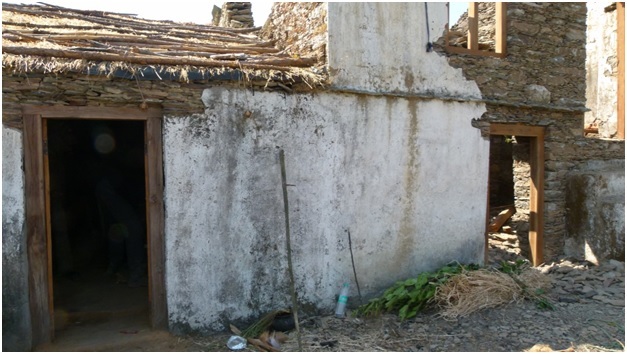 He is basedat“Sparrows’ Nest Corbett”, a home stay in Corbett area run on run on sound eco-tourism principles. 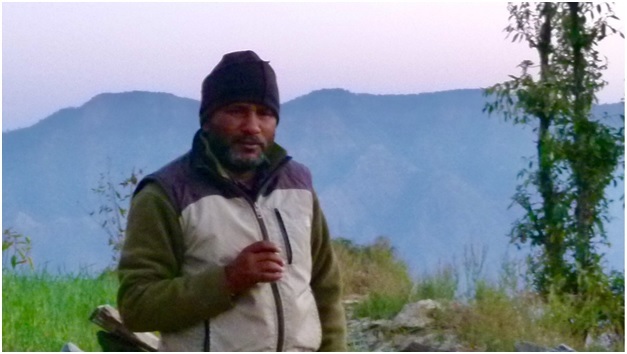 Dev S. Hari: A local residentof Corbett;writer, story-teller, social entrepreneur, sketch artist, and a well-known mountaineer and naturelover.He received an award for Tiger Conservation from the reputed international organization, WWF-India Terai Arc Landscape project, based on his knowledge and awareness of the Corbett area. One Self Help Group (SHG) which is run by a group of Ringora village women, focusses on livelihood generation. Volunteervisitors will learn about their work, current projects and problems that they facein fulfilling their needs and future plans. During the interaction, Simon Robinson, a volunteer from the UK,was introduced to the craft work they are undertaking; the groups of women make ropes from old single-use plastic such as chip packets, sweet wrappers etc. Their work is very inspirational and unique, providing a livelihood for themselves whilst at the same time sending a message to the wider community regarding the benefits of waste management. 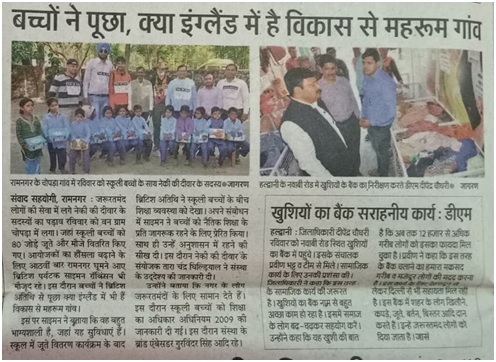 Two rural schools in the Corbett area have been selected for this initiative; one is in Sunderkhal village and the other is in Bedajhal village. We started with introductory sessions “Hello, I am Sunderkhal” followed by some fun and games. The participants were divided into two groups and taught how to introduce themselves in English with a smile!This is a very effective tool,helping the students to overcome their natural inhibition and communicate with confidence.This was followed by a presentation on “The Importance of Segregation for proper Dry Waste Management” given by Priyanka. 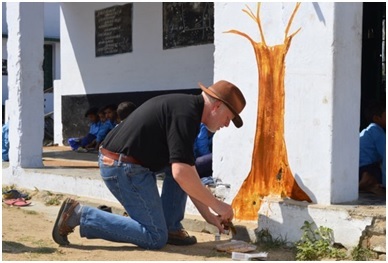 At the same time Hari, helped by Simon, created some ecological artwork on the outside wall of the school building, the main feature of which was a tree.The students were then invited to participate by creating the foliage using their own hand-prints. Fun games played by Priyanka with the school kids on running themes. Inthis gameall participants (students plus Simon) ran in a circle and at random timesHari would call out a number and all the participants then formed groups of that number. Anyone left over and not in a group was out of the game. At the end the last group surviving was the winner. 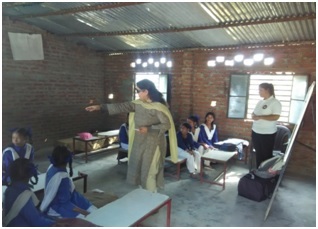 We then ran some sessions on the importance of quality education demonstrating varied teaching methods. This was followed bymore fun and games. 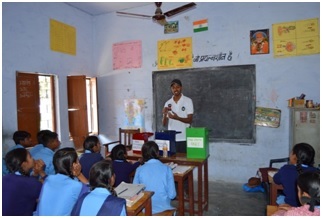 Work on Importance of Segregation in proper solid waste management and learning methods for students. We also explainedan impact assessment for the improvementof dry waste management. 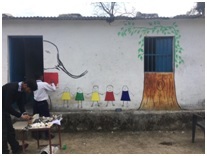 An interesting session was given by Priyanka and Amrita on “The Importance of Segregation for proper Dry Waste Management Practice” and, finally, a wall painting was created by all 32 participants. 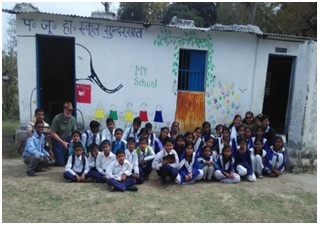 Wall painting activity with the kids and group photo with all the participants. At the end the event closed with pictures and smiles and a finalshake of hands all round for the beautiful art work on the school walls, which was inaugurated by Hari and Simon. 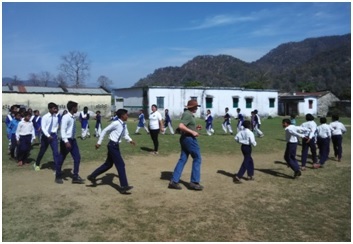 The visit to the school in Bedajhal was carried out by Hari and Simon, and followed a similar pattern to the Sunderkhal activities, including introduction, fun and games, a presentation on Solid Waste Management by Hari anda wall painting. 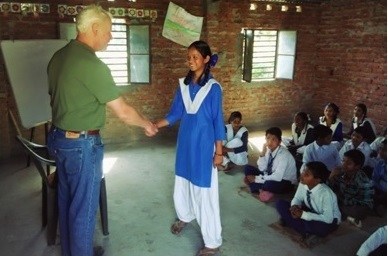 In Bedajhal School the activity began with an introduction which focussed on students’ hobbies and career hopes. 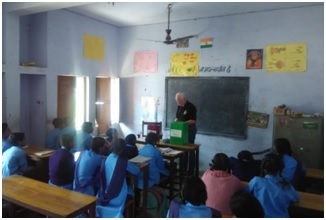 This was followed by the sharing of some life stories fromboth students and Simon, including questions and answers about our own countries, what schools in the United Kingdom are like and about Simon’s journey from England to India. We also showed the students where England is compared to India and where in England Simon lives using Google Earth, so that they could locate it easily and remember where it was. This activity demonstrated how we can start waste management on our own through segregation at source. One wall was selected for the team work activity and the students were asked for their contribution and ideas. 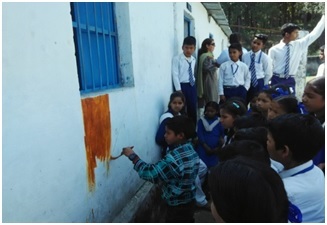 Their response was very positive and a wall painting was started with all students getting involved. 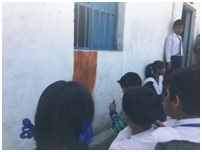 The wall painting activity involved all students;we talked to the kids and showed them how they could contribute towards a painting on their school wall. We agreed with them that we would do a similar design to the one at Sunderkhal School – a tree representing nature, with branches and leaves made using the hands of the children to represent their connection with the natural world. The aim of this activity is to strengthen and develop an understanding of the importance of team work through an enjoyable and fun exercise. Neki ki diwaar is an initiative aimed at helping those who are in need of one of life’s basic requirements. 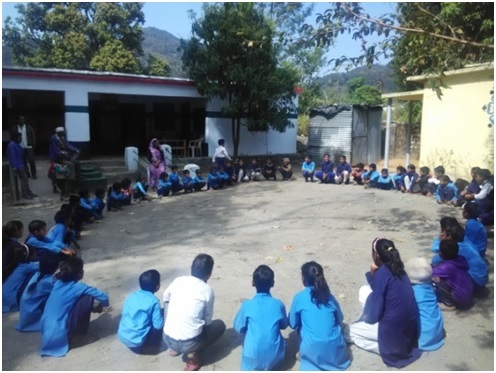 School kids playing fun games in the school campus; we use games to focus on developing team workingskills through enjoyment. This event was reported in local newspapers. 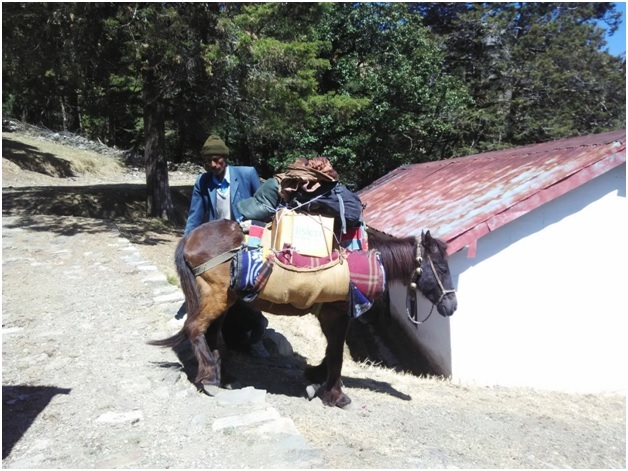 Simon Robinson commented;“Wonderful day at Chopra Village yesterday, the village is deep in the forest and is not easily accessible. 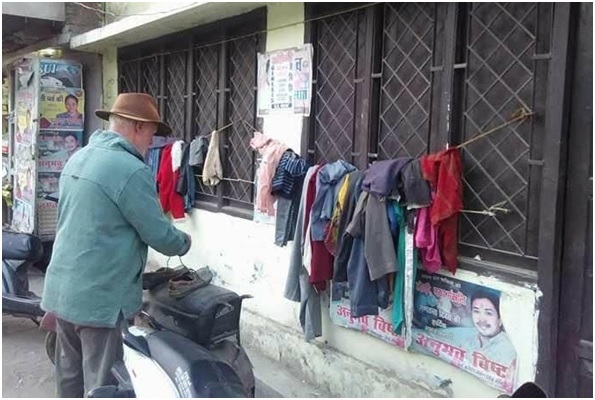 Amenities which would be considered essential in the West do not exist – there is one running water tap in the village, no electricity save for some small solar lighting units and no telephone – landline or otherwise. The nearest hospital or medical facilities are at least an hour away, and then, only if the road is passable – to my eye it seemed pretty tricky in the dry; it must be sensationally “interesting”during the monsoon!!! 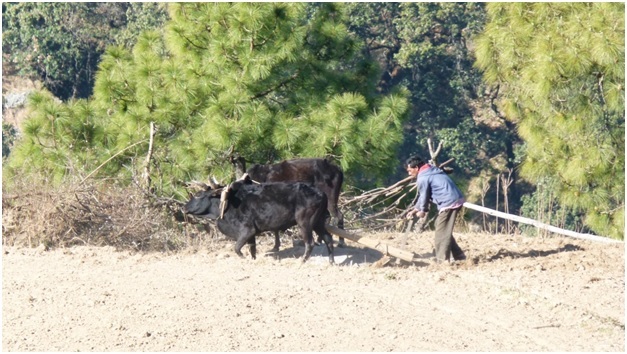 Crops and livestock are at continual risk of devastation from the other inhabitants of the forest!! The people there clearly have a great communal ethos; they are rightly proud of the village and their self-sufficiency but would appreciate a more developed infrastructure. They are friendly, upbeat and gave a very generous welcome to us all. I am so grateful to Tara Chandra Ghidyal and the rest of the team for the opportunity to visit and grateful to the villagers for their generosity of time and spirit. 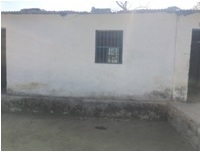 The Wall of Kindness team provided the village children with some school shoes which had been donated locally. Group photo with the organiser and participantsat Chopravillage. 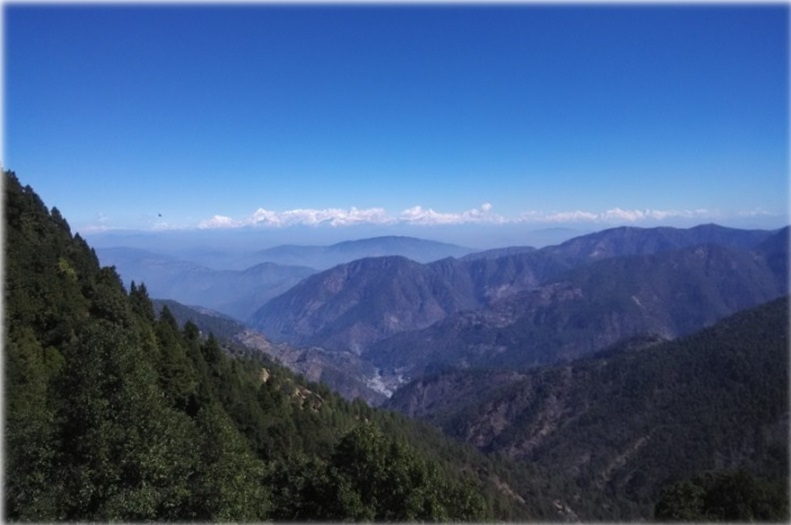 The journey started with a taxi trip from Ramnagar to Kunjakhadak, a beautiful location under the management of Nainital Forest Division. 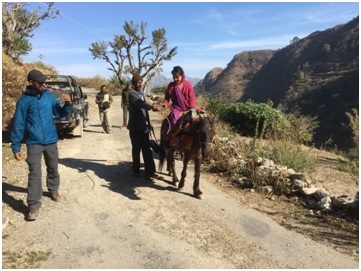 We reached there around 11 am and there we met Mr Kashiram who was to be our local guide,and his horse Kallu, who helped by carrying extra luggage. 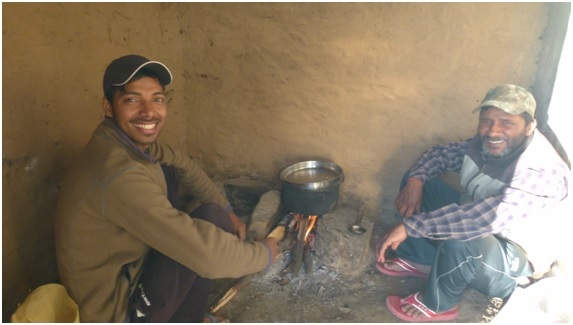 Mr. Kashiram with Kallu preparing for trekking. The walk started from Kunjakhadak at around 1 o’clock in the afternoon and after two and a half hours we arrived at our first destination village, Kultani, where we would be staying overnight. The original intention had been to set up camp on the local hillside, but,in the end, we used the open porch of the village school. 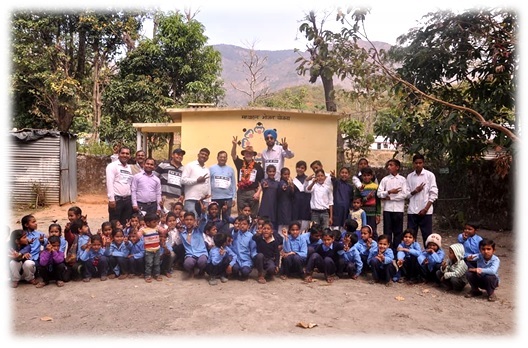 The village school serves a farming community which is very widespread – the nearest building is around half a mile away and the homes of the children are spread across the local hills. 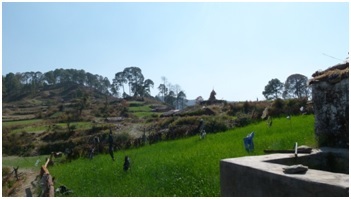 The village is very beautiful and is famous for the ginger, garlic, turmeric and local vegetables grown there. We set up a kitchen in an unused side-room of the school and after collecting firewoodfrom the hillside Ramesh and Hari prepared dinner and Simon was able to climb the hill for a bit of exploration and meditation. We ended the day with a delicious dinner. 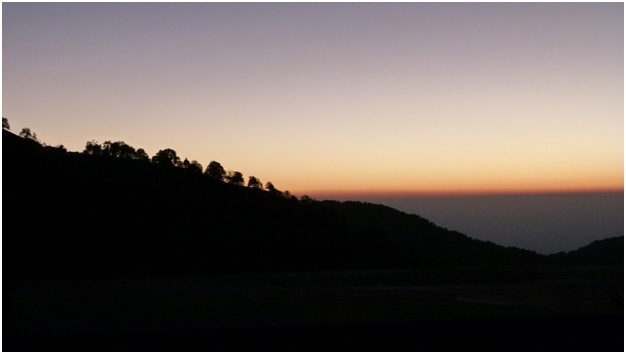 The night was very cold but before going to sleep we enjoyed a spectacular sunset and the view of the stars and planets on a clear mountain night was truly glorious. The next day was a long trek with lots of ups and downs; we started in the early morning and reached our destination of Akashkanda at around 3 o’clock in the afternoon.Once we were clear of the Kultani farming community the trek took us through heavily forested hills and valleys, crossing small rivers and streams en route. There were signs of a healthy wildlife population including leopard and bear, although the only large animal that we saw were Goral.The Rhododendron Arborium were in flower and, as well as being easy on the eye, the flower petals are edible and the sugary sap is surprisingly tasty. 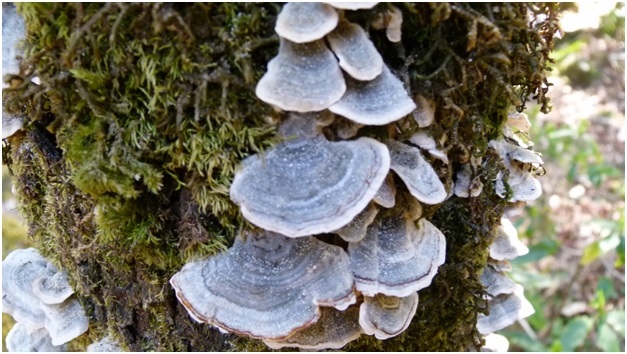 Kashiram also showed us lichens growing in the forest that the local people use to flavour their food. 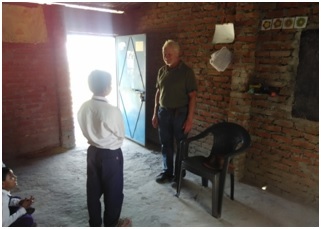 At Akashkanda we had arranged to stay in Kashiram’s house; it had suffered a fire in 2017 and he was in the process of rebuilding it, but one room was complete and comfortable. At Akashkanda we were made very welcome. 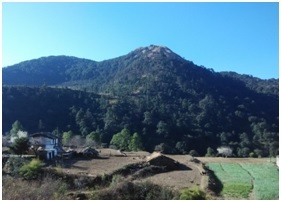 The village is sited on a promontory in the Shivalik Range. 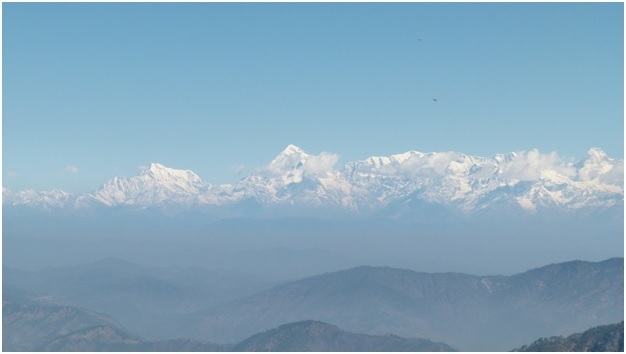 It is very beautiful with stunning views of the Himalayas, and it is well maintained. There are no roads and the route we took through the forest is the main way in or out. At the time of our stay there was no mains electricity, although a project to run power to the village was underway and expected to be completed later in 2018. After a walk around the village we had another excellent dinner, prepared by local women, and spent the evening enjoying the sounds of a wedding which was taking place in the village. The four of us had a good night’s sleep in Kashiram’s house, a fire was burning and the room was warm. We were told not to go outside alone at night as there were leopards in the area but this was not a problem, and we awoke early on a cool morning to see the sun over the Himalayas whilst we enjoyed or coffee and chai. Cool early morning – Himalayasand chai! Our final day started with a good breakfast, and thenwe set out from Akashkanda for Domas. We were joined by one of Kashiram’s daughters – Kashiram planned to travel to Ramnagar with us and she would take Kallu back to the village. 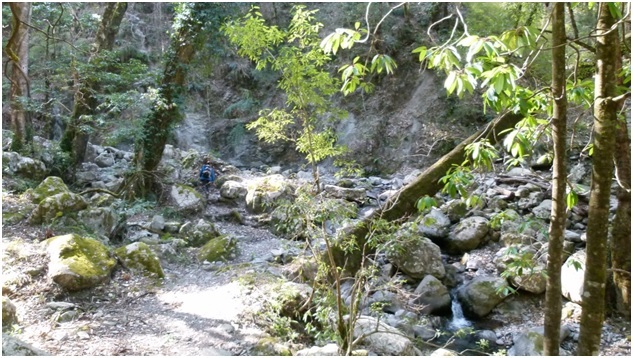 The route was mainly downhill along a rough path cut into the mountainside. It was less heavily wooded than the previous day’s route but the flora was still amazing and there was wildlife a-plenty to be seen including Mountain goat, barbet, kestrel, vultures and many other bird species. The hike to Domas took around 3 hours. 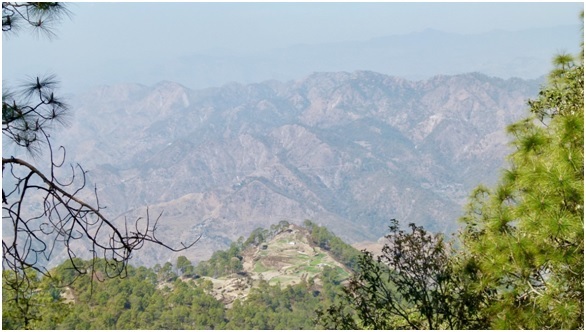 Once again, we got an insight into how isolated the small hill farming communities in Kumaon really are. At Domas we said goodbye to Kallu and to Kashiram’s daughter and took an open gypsy drive back to Ramnagar. 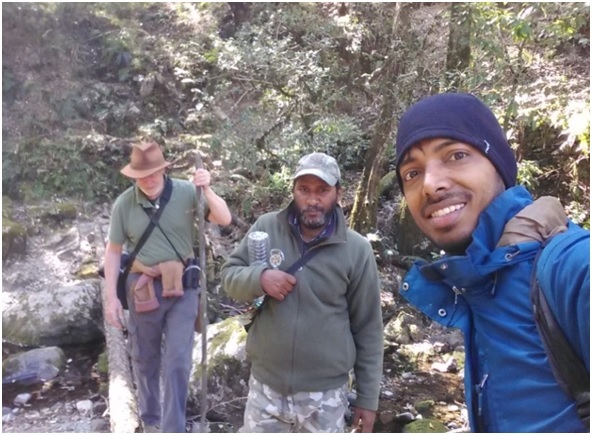 This trek was very enjoyable but was also a great learning experience; to quote Ramesh:“Nature is great teacher, sometimes it gives us a parallel support during our journey and sometimes it makes us strong through natural challenges.”Hopefully others will enjoy learning the same lesson in the future!